The wisest resident of the Hundred Acre Wood. Whenever anyone has a question he can't answer, he asks the Owl... though Owl isn't always right! Owl likes to talk, but sometimes he puts his listeners to sleep. He showed us the wisdom of his ways in "Winnie the Pooh and the Honey Tree" (1966). The wisest animal in the Hundred Acre Wood. Sometimes he talks so much his friends fall asleep. Owl seems to be the wisest resident of the Hundred Acre Wood. Whenever anyone has a question they can't answer, they ask Owl. He's always happy to help, but his answers aren't exactly right! The wisest animal in the Hundred Acre Wood. But beware: his answers aren't always right! "After all, I must tell you of my Uncle Albert's adventures at sea." Owl is one of many animals who live in the 100 Acre Wood. He helps Sora while he is in the 100 Acre Wood with advice on mini-games and how to find more Torn Pages. Owl functions as the narrator and tutorial guide in the 100 Acre Wood telling Sora when he needs to find more pages, giving him help with mini-games, and providing instructions. He is sometimes seen talking to other characters, such as Pooh or Tigger. Owl is part of the challenge to find Pooh's friends. He is seen flying overhead. 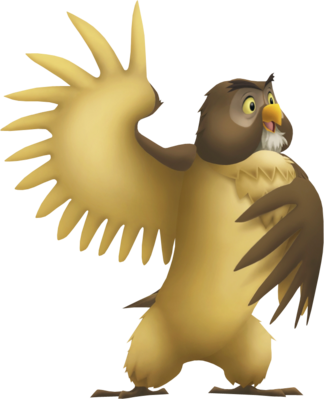 Owl plays the same role as he did in the first Kingdom Hearts title providing Sora with instruction. However, unlike the first game, he plays more a role in the story of the world. Owl is, as his name would suggest, an anthropomorphized owl with light tan plumage on his underside and brown plumage on his head, tail, and back. His three-taloned feet are also brown. He has a short tuft of white feathers just under his beak, somewhat resembling a beard. The area around his eyes is a slightly lighter shade of brown. His eyes are black with pale yellow sclera, and his eyebrows are dark brown. Finally, Owl's beak is yellow. Owl is the most intelligent of the Hundred Acre Wood characters, who spreads his knowledge irrespective of someone wanting it or not. He speaks very eloquently and is often found rambling to others various stories related to his relatives. A bit arrogant at times, he has only the best interests at heart. Like the rest of Winnie the Pooh's friends, he originated in A. A. Milne's book Winnie-the-Pooh. His first Disney appearance was in Walt Disney's short Winnie the Pooh and the Blustery Day. This page was last edited on 12 February 2019, at 13:19.